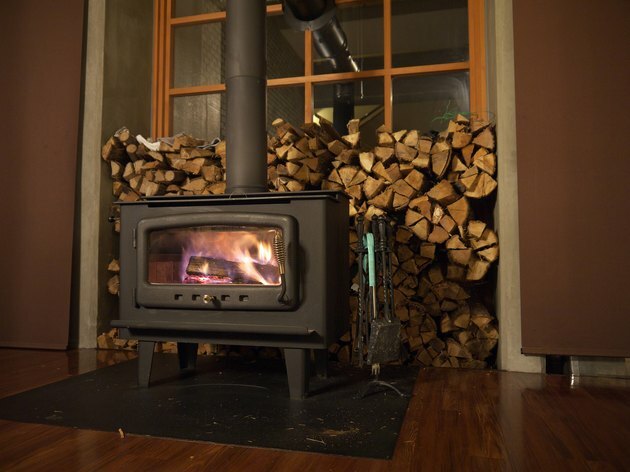 A wood stove can be a cost-effective means to heat a room or entire tiny house. They have become a more popular choice for consumers due to the rise in natural gas costs and increase in electricity fees. A stove in front of a window is a lovely addition as well as a heat provider for the room. However, where you install a wood stove is important. While a wood stove is a charming addition to any room, there are some precautions to take when choosing, installing and ventilating a wood-burning stove for the home. Correct clearance for a wood stove is vital for safety. A wood stove that is installed incorrectly can be a fire hazard and can cause carbon monoxide or smoke to build up in the home. A wood stove needs to have at least 36 inches of clearance between an unprotected ceiling and the top of the stove. When installing a wood stove in front of a window, make sure the clearance is at least 36 inches from the glass to keep it from heating up and cracking or getting damaged. Warm and inviting, there are many benefits to having a wood stove. There are also many safety considerations when installing a wood stove. Install a carbon monoxide detector in the same room where the wood stove resides. Check the batteries and the detector annually. At the beginning of each season, inspect the stovepipes and chimneys, which can get choked with creosote. Have a fire extinguisher close at hand when operating the wood stove. Wood can pop and cinders can fly far from the mouth of the stove if it is left open. A small glass door wood stove is as charming in its aesthetic as it is efficient in its heating capabilities. The type and heating capacity of the wood stove you choose will depend on the size of the room or living areas you hope to keep toasty. 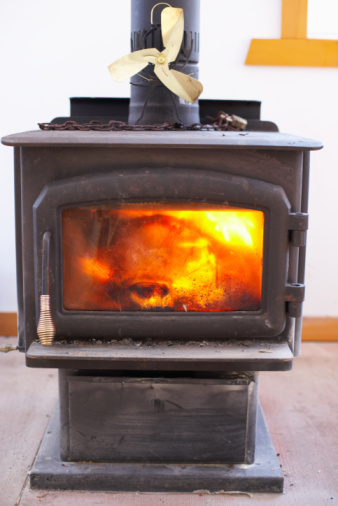 The wood stove you purchase should be approved by a recognized testing laboratory. This approval lets you know that the wood stove is made of the correct sturdy materials and is the right size for your needs. Wood stoves placed in front of windows can be small and decorative, but the safety precautions should still be taken just as seriously as for a hulking wood stove. Check the manufacturer's instructions before lighting that first fire in the stove in front of the window. If the wood stove calls for a layer of sand or brick to be placed in the bottom of the firebox, do that before installation. Make sure the flooring that the stove will sit on is noncombustible or has a layer of approved floor protection material under the appliance. This flooring or protective layer should extend at least six inches away from the stove sides and back and a good 18 inches in front of the stove where wood will be loaded. Combustible materials should be a minimum of 36 inches from the wood stove. If this isn't possible, a layer of fire-resistant material can be wrapped around posts, exposed walls or woodwork to protect the area. All stove pipes should be less than 10 feet and made of 22- or 24-gauge metal. Maintain a minimum of 18 inches between the ceiling or other combustible material and the top of the stove pipe. For safety, the stove pipe should enter the chimney above the level of the outlet of the firebox and should not overlap into the chimney's flue lining.